Pilot’s error is being named as the preliminary cause of the Vnukovo airport TU-204 jet crash, the Investigative Committee said. 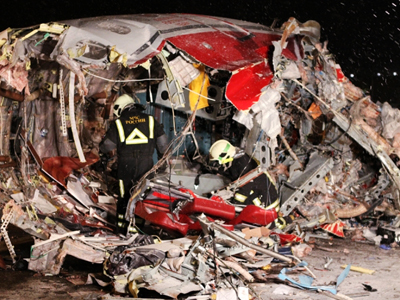 Four people died and four others were critically injured after the plane crash-landed, skidding onto a nearby highway. ­A criminal case concerning flight safety and aircraft employment violations has been opened in connection with the TU-204 plane crash, the official spokesman of Investigative Committee Vladimir Markin said. The preliminary cause of the accident is pilots’ error, Markin said. Other versions are being considered, including adverse weather and aircraft system failure, he added. The plane’s crew was “very experienced,” Rosaviation head Aleksander Neradko said, adding that the pilots have had between 10 to 15 thousand hours of total flying time. The TU-204’s runway approach started with “good performance” figures, he stated. Why the plane was not able to stop on the runway remains unknown, Neradko added. Two black boxes from the plane have been found on the site of the accident, the Investigative Committee reported. “Two flight data recorders will be handed over to experts for deciphering after being inspected by investigators,” Markin said. Witnesses of the accident are now being questioned, investigators said. The injured crew members will also be debriefed as soon as they are in a stable enough condition, officials added. Prosecutor General’s Office has taken control of the investigation. The crash-landing of the TU-204, run by Russian firm Red Wings, was reported to rescuers at 16:37 Moscow time. The plane, flying from the Czech Republic, crashed into a runway at Vnukovo airport upon decent, it then skidded off the runway stopping on the nearby Kievskoe highway. The plane broke into three during the crash with the right wing ablaze, firefighters took 30 minutes to extinguish the flames. “When the aircraft hit this very deep ditch it actually broke up. So it must have been going… very fast when it went over the end of the runway, and we can only speculate how it might have been so,” David Learmount, operations and safety editor from Flight Global Magazine, told RT. “We may well be looking at the misjudgment issue here, unless there were technical problems the crew had to deal with that we have no news of yet,” Learmount noted. The TU-204, which had been operated by Red Wings for four years, was carrying eight people, none of whom were passengers. “There was only the crew aboard. Before taking off the operating company checked all the plane’s systems and said they were functioning normally,” a spokesperson from the Czech Republic Pardubice airport, told Gazeta.ru. The plane was last serviced at the Vnukovo international maintenance repair & overhaul center on December 14, a Red Wings airline statement said. 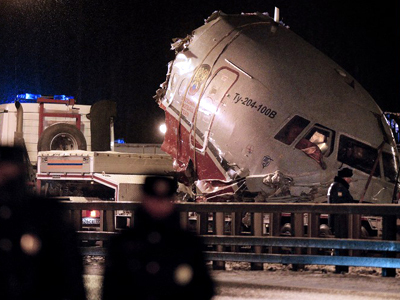 Until now, the medium-range Tupolev TU-204 airliner has not been involved in any fatal accidents. “Certainly it’s a very modern airplane and it does have an absolutely first-class technical history,” David Learmount told RT. “Tupolev 204 is a fairly reliable aircraft. 73 pieces have been produced so far and 62 are still in service. So far there’s been only one hull loss accident, which happened in 2010. And it was not because of some hardware malfunction, it was pilot’s error: they were using GPS equipment not certified for precision landing,” pilot and aviation expert Yury Karash told RT. The 2010 crash-landing injured four out of the eight crew members on board and the plane had to be written-off. In September 2009, another TU-204 jet from Red Wings fleet, carrying 204 passengers, had to make a forced landing. On that occasion the incident was attributed to a failure with the engine vibration monitoring system. No injuries were reported. Similar cases of TU-204 planes overrunning the runway have occurred before, and they were caused by specific system failures, a source from Russia’s federal aviation body (Rosaviation) told RIA Novosti. Recently, a TU-204 was subject to braking system failure in Novosibirsk airport on December 21. 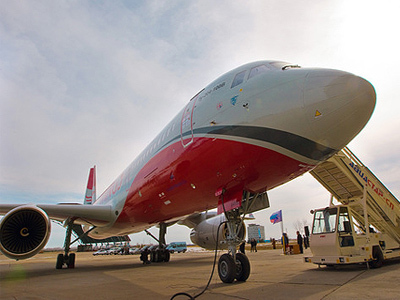 Rosaviation has already sent a directive to Tupolev design bureau asking for urgent preventive measures development.